Should I Buy a Boat with Blisters? One of the most frequently asked questions that a marine surveyor gets is, “Should I buy a boat that has blisters?” This is a question that I’ve wrangled with for many years, and after a great deal of research involving thousands of boats. This essay will answer your questions a bit more directly than some of our more detailed blister essays, which many of you found hard to understand. That’s understandable because this is a very complex subject. But be prepared that the answer is populated with a lot of ifs, ands, and buts. Let’s face it, an awful lot of boats have blisters, so that finding one that doesn’t (or won’t get them) can be a difficult proposition. The short answer is that if at all possible, you should try to avoid that, if for no other reason than the potential expense you may face in the future. That expense may not result from the absolute necessity to repair the blisters, but the position you may find yourself in when it comes time to sell the boat. Particularly with newer model boats, say 1 – 3 years old, it is not unusual for buyers demand a reduction in price, or that the blisters be repaired. For older boats, its usually much less of a problem, for the fact is that moderate blistering on an older boat rarely impedes the sale. Unfortunately, another fact of boating life is that there is a great deal of misinformation on this much talked-about subject. One common misconception is that blisters seriously weaken and/or damage boat hulls. In 30 years of surveying and examining around 4000 hulls, I have seen less than 10 cases where blisters have resulted in serious structural degradation of a hull where it was weakened to a point where some type of failure was immanent. First, let’s understand that all fiberglass hulls absorb water to some degree because both the gel coat finish on the exterior, and the fiberglass reinforced plastic is porous. Since water is a solvent, it will react with the plastic resulting in the water and solvents in the plastic mixing to create a weak solvent solution, usually with styrene. This then softens the gel coat somewhat and, combined with a bit of gas or fluid pressure, results in the blister. Here’s a subject I get a lot of questions about, and one that I want to address it upfront. Since I have already stated that all fiberglass boats absorb water to some degree, and often without causing blistering, it follows that the use of a moisture meter is useless. 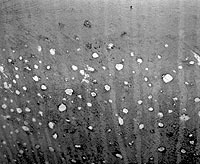 If you doubt this, please see the essay Illustration of Water Absorption From Hull Interior on this site. It shows a hull that has been completely water saturated for 10 years, but has not developed blisters. Moisture meters measure only the surface moisture, and since gel coat and paint is very porous, the moisture meter is only going to tell you what you already know; its wet. It cannot tell you anything about the propensity of a hull to blister. While these instruments have their uses, predicting whether a hull is prone to blistering is not one of them. See also Moisture Meters on Boat Hulls. Yes, but. This is a question of how much harm. Blisters form at the interface between the gel coat and what is called the skinout mat, which is a layer of chopped, short-strand fiberglass that is used to prevent the coarser weave pattern of heavier fiberglass cloth from telegraphing through to the finish surface. You’ve probably seen boats with a checkerboard pattern showing on the surface, and this is the reason why. Now, fiberglass fabric, being made of bundles of very fine glass fibers, is very porous also, most especially the outer layer of mat. Once the gel coat absorbs water, the fibers in the mat that are unsaturated with resin then spread the water around via the capillary effect. Blistering involves only the gel coat and surface mat in 99% of the cases. This is due to the fact that the structural fabrics, such as roving, get saturated better. Its also because the water is less likely to penetrate beyond the mat and, even if it does, woven fabrics do not have the weak gel coat factor and are much too strong to allow whatever pressure may develop within a void to cause a separation. The incidence of blisters occurring within structural laminates is extremely small. If the resin used to make the hull is of a lower quality that will react with water, a process known as hydrolysis, which means nothing more than becoming saturated with water and dissolving, then the hull is poised to develop blisters. Many other factors also come into play here, such as how well the mat layer is bonded to the gel coat. Since the vast majority of blisters occur between the mat and gel coat (depicted in illustration above), this bond has to be fairly weak for the blistering process to occur. If the bond is strong, then blisters will not occur, even though there is a lot of water absorption. This is a very general, even generic, description of the blistering process. There are frequently numerous other factors involved which I will not address here. Aside from the damage it causes to the surface, most of the damage done by the blister is to the gel coat and the skin out mat, which is not a structural part of the hull laminate. Remember, the mat is only there to prevent the fabric pattern from showing through to the surface. The obvious question is now, “But isn’t the water dissolving the rest of the plastic resin in the laminate?” The answer to that is “No, its not.” At least not to any considerable degree. You may have noticed that I have not used the word “osmosis” that we hear so much these days. Technically, water passing through the porous gel coat is not osmosis; its just water passing through a porous material. However, the blistering process may involve osmosis, a process which concentrates solvents within the space formed by the blister void. This concentration of solvents does indeed dissolve the plastic, but fortunately the amount of fluid involved is so small that it does not seriously threaten the laminate. Of course, the larger the blister, the more concentrated solvent is present, the more damage it will cause. Therefore the amount of damage, and therefore structural weakening caused by blistering, is directly proportional to size and number of blisters. This explains why only boats with very large blisters can end up with serious structural weakness problems. This photo represents a typical case of extensive blisters, small enough to be called pimples. They are dime-sized and smaller, but no matter how many of them there are, they are very unlikely to threaten the structural integrity. But they do make sanding and painting the bottom very difficult, and will cause a slight speed loss on sailboats. Since the vast majority of boats develop only dime-sized blisters, the amount of damage or structural degradation resulting is very small, even when the bottom is extensively blistered. Even boats with numerous blisters up to about 1″ in diameter, usually show no significant weakening of the plastic. 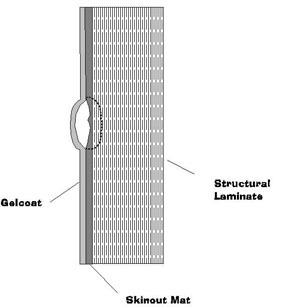 The illustration above shows the relationship of blister size to the laminate thickness. Here it can be seen that even if some of the plastic is dissolved under and around the blister (indicated by dotted line) in proportion to the overall laminate thickness, its not much, even when the amount of degradation is above average. The amount of blistering would have to be truly severe to have even minimal effect. These conclusions are based on two completely different types of evidence. First is the fact that physical inspection, probing and sounding rarely reveals softening or degradation in the area immediately peripheral to the blister. Second, the fact that significant structural weakening will make its presence known (before failure) in the form of delamination, surface deformation and stress cracking. The good news is that I know of no reports of these conditions occurring as a result of blistering, unless the blisters are extremely large. We’re talking here blister 4″ and larger, at which point the problem becomes rather obvious. From these facts I conclude that well over 95% of all hull blistering cases do not cause significant structural damage to the laminate. Getting back to our original question, “Should someone buy a boat with blisters?” can be answered from several viewpoints. If you insist on a boat without blisters, fine, then go try to find one. If its an older boat, you may have little choice, since blistering tends to run in certain builder’s lines and you may have to look at quite a few before you find one. All things being equal, you’d certainly want to choose a boat without blisters. Unfortunately, unless the seller is kind enough to tell you, you can’t find out until the boat is hauled for survey, at which point you’ve already invested some money in it. Its a fact that most blistered boats are sold without regard to the blistering, and this is one of the reasons why. In my experience, the number of cases where blisters cause the boat to be rejected, or give rise to price renegotiations is considerably less than 5%.